Creating and managing your Honey groups. How to create and customize your Honey group. Many of the features described below are only available to Honey admins. If you have questions about who can or cannot see these settings, please don't hesitate to send us a note. We'd be happy to help! 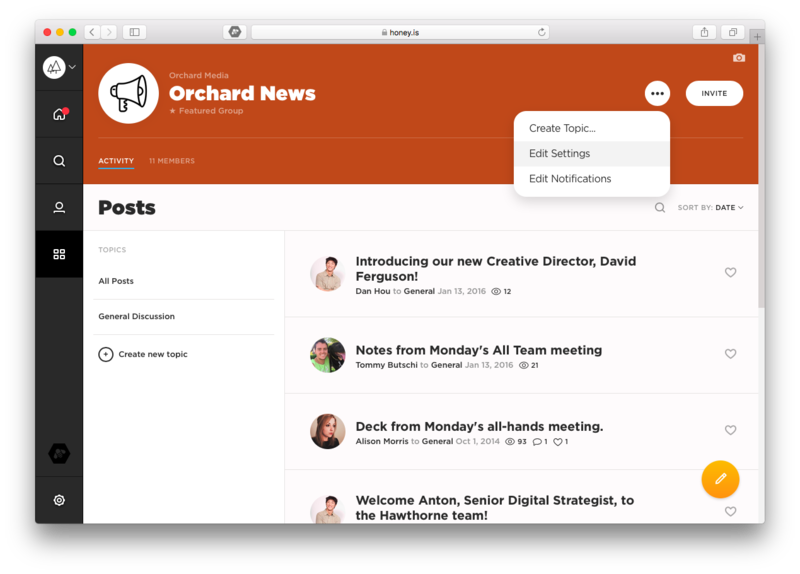 Groups are a simple way to categorize all the posts you and your team members share on Honey. 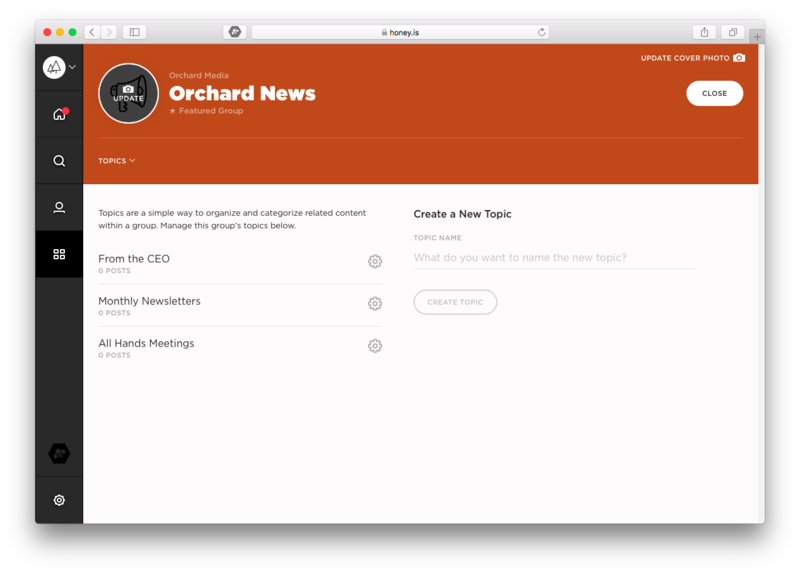 Groups can be used to house regular updates, resources, file libraries, and more. Let's dive in. Visit your groups page by clicking the tile icon in your lefthand navigation menu. Then, click Create New Group in the page header. Fill in the group name and organization in the pop up window. If desired, toggle the private button to make a private group. You can learn more about private groups below. 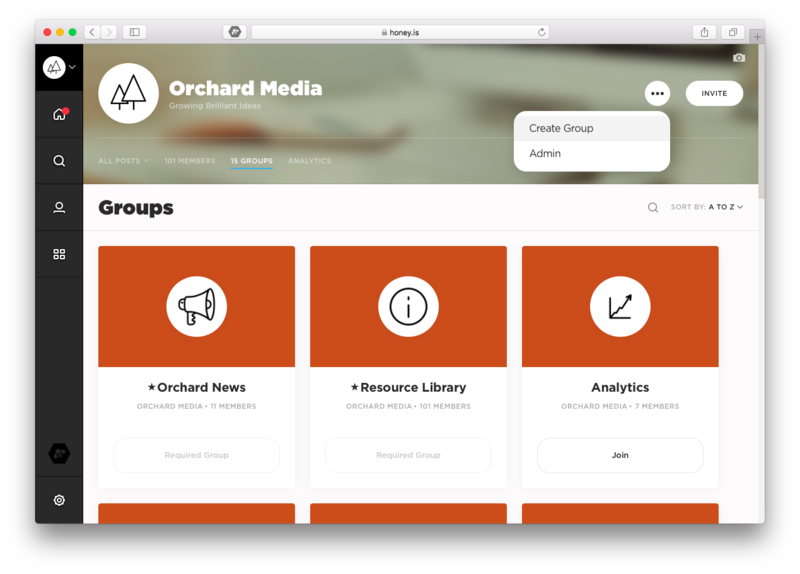 Once created, you should be able to find your new group on your groups page. Click into the group whose settings you would like to edit. Click the three button in the page header and select Edit Settings from the dropdown menu. In this page, you can edit the name and description. 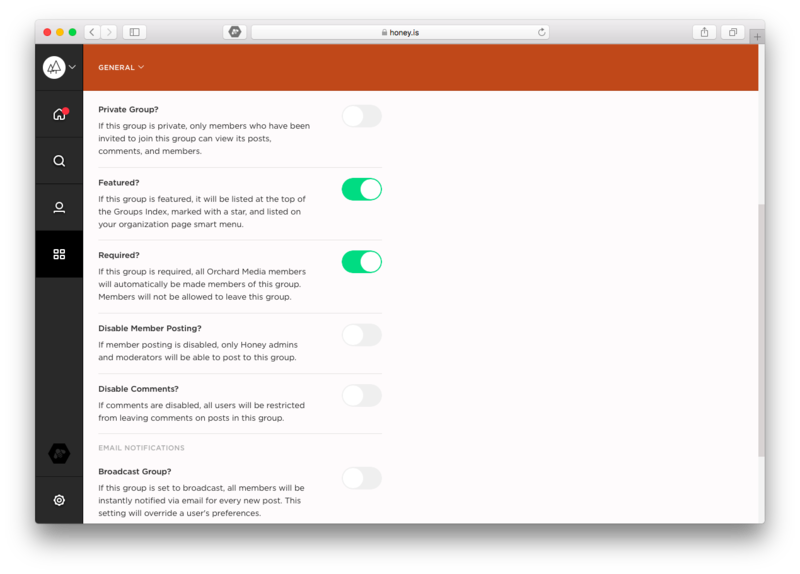 As well was the toggle switches for private, featured, and required groups as well as disabling comments. You can also toggle your email notifications for broadcast groups. You can learn more about these group settings below. You can also delete, merge, or convert to topic with the options on the righthand side. In this section, you'll see a complete list of the six type of group options. The differences between each group type mainly revolves around permissions or who can see posts and who cannot. Keep in mind that you can utilize a combination of the different group types to ensure communication needs are met. Private. Private groups and the content within them can only been seen by users who have been invited to the group. Featured. Featured groups are designated with a star and supersedes the alphabetically arranged groups on your groups page. Featured groups are also housed in the smart menu on your organization page. Required. All members of an organization are required to join this group and they cannot leave the group. Disable member posting. Only admins and moderators may post in the group. Disabled comments. Comments are disabled on posts shared in the group. Broadcast. All users must receive instant email notifications for new posts in the group. Topics are a second level of organization within a group and area an easy way organize, sort, and filter your posts. Click into the group in which you'd like to create your topic(s). Click the three dot button at the top, righthand of the group page and select Create Topic. Fill in the topic name in the pop up window and click the blue Create Topic button. Once created, you'll see your top in your group's smart menu. Click the three dot button at the top, righthand of the group page and select Edit Settings. Select Topics in the page header. Locate the topic you are looking to edit, click the settings cog next to it, and select your preferred action from the dropdown. Editing group's avatar and cover photo. Update your group avatar by hovering over the circle icon at the top, lefthand side to reveal the Update text. Click the text to upload a photo from your files. Update your group cover photo by hovering over the cover photo area at the top header to reveal the camera icon. Click the camera icon to upload a photo from your files.